UPDATE: While I work on perfecting my recipe for cherry clafoutis, I thought I’d share this classic berry pie recipe with you. Blackberries and their kin are starting to show up in markets here in Istanbul, tempting me to try again with pie making (we have a somewhat troubled history – mainly due to my impatience with pastry). It’s not a very Turkish thing, pie, but I’m going to try this recipe on my soon-to-be in-laws and see how it goes down. Wish me luck. This pie was inspired by the plump, sweet blackberries I found in the mobile veg van that calls at my office on a Thursday. The wonderful people at Cultivate – a non-profit social enterprise that brings fresh, organic produce from local farmers to the city of Oxford – always have a mouth-watering array of fresh fruit and veg, but this was my first purchase. And, my, was it worth it! 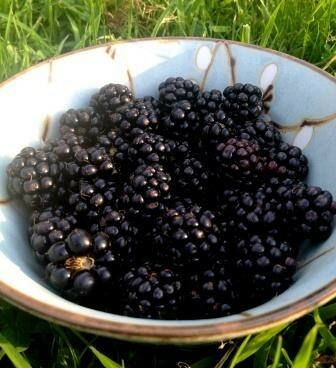 When tempted by blackberries, I’d usually opt for a safe crumble. 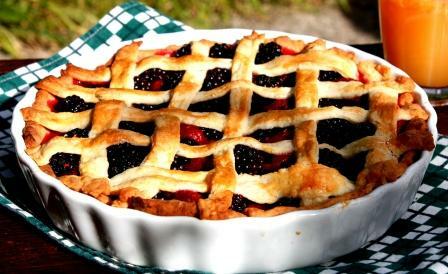 But these berries were so beautiful that I wanted to make something that’d show them off, so I decided to make a pie. Pie, pie, pie. I love pie. Give me any kind of pie, with any kind of filling, and I will fall upon it gleefully. Sweet or savoury, there’s something about gooey, gloopy filling combined with crisp crust that gets my taste buds going. Until now, I’ve never bothered to make a pie from scratch. Sure, I’ve made pie before – banoffee being a speciality of mine – but I’ve always just bought ready-rolled pastry and focused my energy on the filling. Making my own pastry always seemed like LOADS of effort – why make something so fiddly when you can buy a perfectly decent version of it? (I’m aware you can make this argument about lots of things, but let’s just focus on pastry for now). Well. Having spent my Saturday afternoon making this scrumptious autumn berry pie, I can say that, if you’ve got lots of time and nothing much to do, making your own pie can be extremely rewarding. I’m never going to be the kind of person who gets home after a long day’s work and whips up a delicious savoury pie from scratch (and thanks to the lovely people at Jus-Roll, I’ll never have to be), but eating a pie that I’ve 100% made myself was a different kind of enjoyment. It seems like there’s a lot of mystique around pastry-making, which is partly what put me off having a go. Maybe more faff is required if you’re a pro and/or competing in the Great British Bake Off, but I just stuck to the instructions I’d been given, kept the dough cool and tried not to touch it more than necessary – and what came out at the end tasted just dandy to me. But then again, I am biased… why don’t you have a go and let me know how you get on? *Apparently, the vinegar helps crisp up the pastry. I used it, but if you don’t have any around this isn’t essential. NB I don’t have a food processor so I made my pastry by hand. I’m told using a food processor can help prevent you over-working the dough, but I managed just fine without. Sieve the icing sugar and the flour together, holding the sieve up high to ‘air’ the mixture. Next, add the butter and rub into the flour-sugar mixture until you have a texture like breadcrumbs (don’t go overboard here, a little coarseness is okay. I got hand-cramp doing this, so watch out). Crack in your egg, dash in the vinegar, and mix in with a wide-bladed knife, stirring firmly so that the mixture starts to come together. Depending on the size of your egg, you’ll probably need to add a little water to get the dough to form: do this teaspoon by teaspoon, and use cold water. You’ll need to switch from knife blade to hands as the dough comes together. It should come together leaving the sides of the bowl relatively clean – if it doesn’t add a tiny bit more water. Go easy here, the dough doesn’t need to be totally smooth and perfect. Divide into two balls, wrap in cling film and leave in the fridge for half an hour. Lightly flour your work surface and rolling pin. Roll out one of your pastry balls until it’s big enough for your pie dish and use it to line a shallow pie dish (I used one with a 24-cm diameter and the dough was *just* enough). You need it to be thin, but not too thin – about a quarter inch. Return to the fridge, and chill for another 15 minutes. While your blind-baked pastry is cooling, take your fruit and mix with the sugar, cornflour and lemon juice. Do it gently – we’re not making jam tarts here, people. Fill your cooled pie shell with the berry mixture. It’s really important it’s properly cool here, otherwise your lattice strips will melt while you work and you’ll end up with a big soggy mess. Roll out your other ball of pastry dough on your floured work surface, and cut into 9-10 thin strips (again, keep ‘em thin). 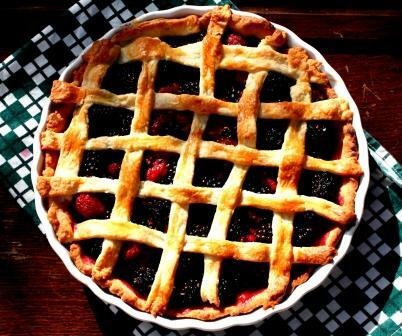 Now you’re going to make your lattice. I couldn’t find much by way of help on how to do this, but I used the following trick. Lay out all of your strips going vertically first, but don’t press down the edges yet. Then, working from the bottom left-hand side up, weave through your horizontal strips by lifting up each vertical strip. Be gentle with your pastry while you do this, and don’t worry if it’s not perfect (see mine for a good example of imperfection): the point is that it’s going to taste amazing. Tuck the ends of each strip over the pastry edges of the pie, and brush all exposed pastry with some beaten egg. Place your pie in the centre of the oven and bake until the lattice is golden and the fruit is bubbling around it – it took mine about 20 minutes. Serve with ice cream or cream, and devour!